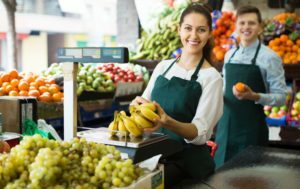 High turnover, poor shift planning with insufficient staff or unplanned overtime, plus attendance and compliance issues often plague the retail and grocery industries resulting in significant impacts to the bottom line. Your employees can make or break your business (just look at what happened at Market Basket). There is a better way to manage your workforce productivity, compliance requirements and make the most of limited margins and resources. Checkmate has be serving the payroll, time and attendance, HRIS and ACA reporting and compliance needs of retailers, grocers and other clients throughout New England for more than 20 years. 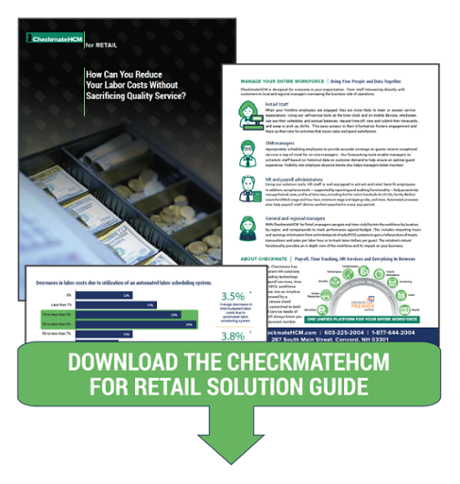 Checkmate HCM workforce software can be configured and scaled to meet the unique requirements of a single-store boutique retailer or a 100-store grocery chain. Our single database platform with intuitive user interface serves the needs of employees simply needing to view a paycheck, clock in or set up direct deposit using ESS; managers seeking to approve time-off requests, schedule a shift, complete an employee performance review or identify employees needing specific training or certifications; and c-level leadership and owners who need to view global workforce productivity and labor costs. Let us help you get the most out of of your workers and your workforce management budget. We are here to help and promise that your Client Account Manager at Checkmate will always know you by name and be eager to serve your payroll processing and other workforce needs. 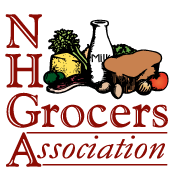 Checkmate is a proud service provider for NH Retail Association and NH Grocers Association members.